The wise men came to the house where the baby was. They saw the baby with his mother Mary. The wise men bowed down and worshiped the baby. The wise men opened the gifts they brought for the baby. They gave the baby treasures of gold, frankincense, and myrrh. But God warned the wise men in a dream. God warned them not to go back to Herod. So the wise men went home to their own country a different way. 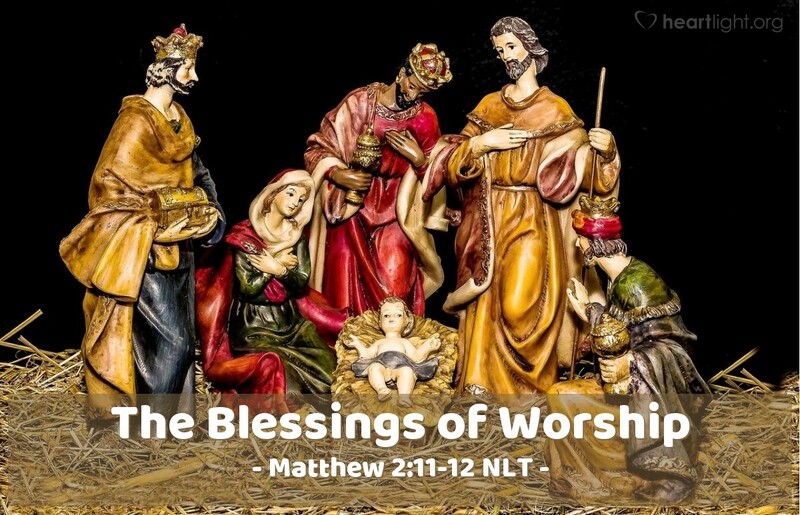 While Herod tried using his knowledge of Jesus' birth to kill him, the Magi used this knowledge to find him and worship him. Their worship involved giving of themselves, their time, their treasure, and their honor. Like them, when we truly come to Jesus to worship him, we must be willing to offer our time, our treasure, our honor, and ourselves; then God reveals his will to us and uses us to bless the work of Christ. Loving God, Father of my Lord Jesus Christ, I love you and thank you for sending Jesus, my Savior and the Creator and Sustainer of the universe. Please receive my heartfelt worship and praise for his worthiness and glory, and use me to advance his cause in the world. In Jesus' name I pray. Amen.